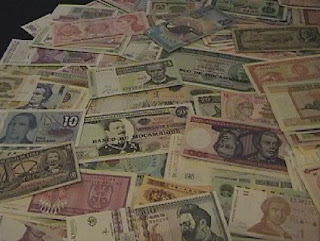 Many a times do we see banknotes and coins of a country portraying various pictures and portraits, which reflect the country’s unique culture, history, heritage and geography. Ranging from portraits of prominent individuals to pictures of natural sceneries, images chosen to be featured on a country’s currency most often accurately represents the culture, politics and geography of the country itself, while serving to remind the people of their proud heritage and culture that must be appreciated and preserved for generations to come. Banknotes all around the world often feature portraits of politicians, scientists, renowned historical figures, rulers, musicians, laureates and others on the obverse (front) side. On the other hand, the reverse (back) side frequently portrays natural sceneries, tourist destinations, national heritages, cultural monuments, social lifestyle and other features relevant to the country itself. Well, the same rule also applies for the uniqueness of Japanese culture and society, which is well-featured on contemporary Japanese banknotes. The currency used by Japan is known as the yen (円, en), which is denoted by the sign ¥. 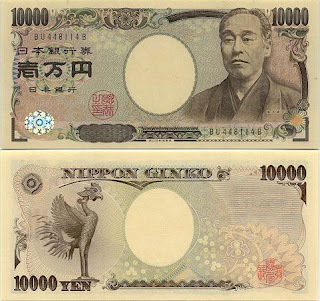 Traditionally, 1 yen can be subdivided into 100 sen (錢) or 1000 rin (厘), but both these subunits are no longer available in circulation since 1953 and are also rarely used in present-day daily transactions. The Japanese yen currently holds the honour of being the third most-traded currency in the foreign exchange market after the American dollar and the euro. Besides this, the Japanese yen is also commonly utilized as a reserve currency alongside the American dollar, the euro and the British pound sterling. For the benefit of those of you who are not familiar with economics, a reserve currency is a foreign currency held in large amounts by worldwide central banks and major monetary authorities as part of their assets. Reserve currencies can also be used as international pricing currencies for transactions involving globally traded products, such as oil and gold. 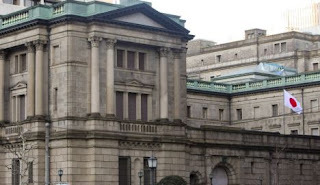 The exclusive authorized issuer of the Japanese yen is the Bank of Japan (日本銀行, Nippon Ginkou), of which its headquarters is situated in the Japanese capital of Tokyo (東京). As and when this article was written, Japan has issued five series of banknotes since the end of World War II in 1945. 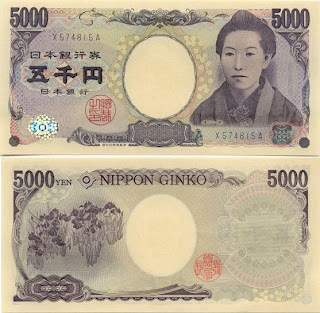 The fifth series, known as Series E, was first issued in 2004 and is currently legal tender in Japan and for international transactions. Series E banknotes comprise of ¥1000, ¥5000 and ¥10,000 banknotes. 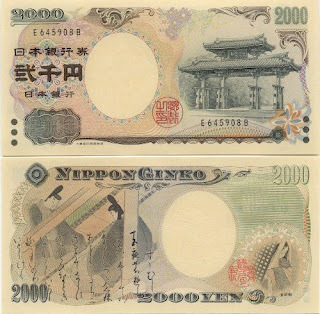 In addition to these banknotes, the ¥2000 banknote, which belongs to Series D (fourth series), is also legal tender. In this article, I will be giving you a walkthrough on the aforementioned banknotes. Alongside pictures of each of these banknotes, I will give a brief description of the portraits and images featured on both the obverse and reverse sides. The above is the 1000 yen, or ¥1000 banknote. The obverse side displays a portrait of Hideyo Noguchi (野口英世, Noguchi Hideyo), also known as Seisaku Noguchi (野口清作, Noguchi Seisaku). Hideyo Noguchi (1876 – 1928) was a renowned Japanese Christian bacteriologist based in America. Born in Inawashiro (猪苗代), Fukushima Prefecture (福島), Dr Noguchi passed his examinations to practice medicine at the age of 20. He is most famous for his remarkable discovery of the Treponema pallidum bacteria, which is the cause of syphilis. Besides this discovery, he also did numerous researches in the medical field, travelling far and wide to conduct researches on poliomyelitis, Oroya fever, trachoma and yellow fever. As a result, he was conferred many awards worldwide and was also nominated for the Nobel Prize several times. Dr Noguchi was very actively involved in researching the yellow fever in order to develop a vaccine for it. In one of his research travels, he travelled to Africa to confirm that yellow fever was caused by a bacteria and not a virus. Ironically, he contracted yellow fever there and died in 1928 in Accra, Gold Coast (modern-day Ghana). Currently, a few research institutions and awards are posthumously named after him, in commemoration of his great and tireless contributions in the field of medical research. On the reverse side of the banknote, one can see an image of the renowned Mount Fuji (富士山, Fuji-san), along with Lake Motosu (本栖湖, Motosu-ko) and a few cherry blossoms (桜, sakura). Mount Fuji holds the record for being the highest mountain in Japan, standing majestically on the boundary between the prefectures of Shizuoka (静岡) and Yamanashi (山梨) west of Tokyo. This dormant volcano, which last erupted in 1707 – 1708, is considered to be a sacred site for the native Japanese religion of Shintoism. Mount Fuji has been frequently featured in Japanese artworks and literature, and is currently one of the most frequented tourist destinations in Japan. Lake Motosu, on the other hand, is one of the five lakes surrounding the majestic peak. This is the 2000 yen, or ¥2000 banknote. A picture of the Shureimon (守礼門) is observable on the obverse side of the banknote. Situated in Naha (那覇), Okinawa Prefecture (沖縄県, Okinawa-ken), the Shureimon is a well-known gate constructed in the 16th century based on Chinese architecture and Ryukyuan influences. This gate is the second of the main gates of the Shuri Castle (首里城, Shuri-jou), which was the imperial palace of the Ryukyu Kingdom (琉球王国, Ryuukyuu-oukoku). During World War II, particularly during the Battle of Okinawa in 1945, buildings and infrastructures on the Okinawa Islands were nearly annihilated, leaving the entire region in a state of desolation. The Shuri Castle and Shureimon were not spared. However, after the war, the Japanese government embarked on major restoration and reconstruction works, rebuilding both the castle and the gate to what it is now, based on historical records and pictures of the original structures before the war. The reverse side features the Tale of Genji (源氏物語, Genji Monogatari) and its author, Murasaki Shikibu (紫式部). On the left side of the note, one can see an image of a scene taken from the Tale of Genji, along with an excerpt taken from an imperial manuscript of the novel. On the bottom right corner, there is a portrait of Murasaki Shikibu (973 – 1014/1025), the author of the novel. The Tale of Genji is widely recognized as the world’s first novel ever written, in which it was written sometime between 1000 to 1008. It is highly regarded as a masterpiece in Japanese literature, whereby the winner of the 1968 Nobel Prize for Literature, Yasunari Kawabata (川端康成, Kawabata Yasunari) once described the novel as “the highest pinnacle of Japanese literature”, adding that “even down to our day there has not been a piece of fiction to compare with it.” If you’d like to read further about the Tale of Genji, feel free to view another post of mine entitled “The Tale of Genji (源氏物語)”. Not only is the novel considered to be remarkable in Japanese culture, its author is also highly revered in Japanese history. Murasaki Shikibu was a prominent poet and novelist who lived during the Heian Period (平安時代, Heian-jidai) (794 – 1185) of Japan. Born in Kyoto (京都) in 973, she was raised in a manner contrary to accepted customs of that time. Later in her life, she became a noblewoman and an honourable lady-in-waiting in the Japanese imperial court, serving Empress Akiko. For interest’s sake, you can also read more about Murasaki Shikibu in another post of mine entitled “Lady Murasaki Shikibu (紫式部)”. For your information, the ¥2000 banknote was first issued in 2000, in commemoration of the 26th G8 Summit which was held in Nago (名護), Okinawa Prefecture, on July 21 – 23, 2000. This is the 5000 yen, or ¥5000 banknote. A portrait of Ichiyo Higuchi (樋口一葉, Higuchi Ichiyou) is displayed on the obverse side of the banknote. Ichiyo Higuchi is the penname of Natsu Higuchi (樋口奈津, Higuchi Natsu) (1872 – 1896), a famous Japanese author born into a family of samurai lineage during the Meiji Era. In spite of her short life, she is highly regarded for her marvelous literary works and is frequently recognized as the first professional female writer in the field of modern Japanese literature. Early in her life, she endured many hardships, whereby she lost both her brother and father in her teenage years and was subsequently forced to take up the responsibility of being the head of the Higuchi family at the age of 17. She initially took up writing for the sole purpose of supporting her poverty-stricken family, but her talent propelled her further up the ladder of success in literature. Many of her novels received numerous acclamations and recognitions from various quarters. Such novels include Takekurabe (たけくらべ, Eng. “Growing Up”), Nigorie (にごりえ, Eng. “Troubled Waters”) and Juusan’ya (十三夜, Eng. “The Thirteenth Night”). However, she passed away in 1896 at the young age of 24 after succumbing to tuberculosis. On the reverse side of the banknote, one can see a picture of Kakitsubata-zu (杜若図), which is a painting of irises by imperial Japanese artist Ogata Korin (尾形光琳) (1658 – 1716). Born in Kyoto in 1658, Ogata Korin grew up to be a prominent artist who developed an impressive style of art considered to be unique during that era. His unique style of painting broke away from the traditional artistic norms of that era, in which he developed an artistic style of bold impressionism distinct from other contemporary painters of the same era. Kakitsubata-zu is particularly one of the most precious cultural heritages, thus it has been declared a National Treasure of Japan by the Japanese government. Finally, this is the 10,000 yen, or ¥10,000 banknote. The obverse side of the banknote displays a portrait of Fukuzawa Yukichi (福澤諭吉). Fukuzawa Yukichi (1835 – 1901) was a prominent Japanese teacher, author, translator and political theorist who was responsible for founding Keio University (慶應義塾大学, Keiou Gijuku Daigaku), Japan’s oldest university. Born in 1835 in Osaka (大阪), he is widely recognized in Japanese history as one of the founders of modern Japan, owing to his large contributions to the Japanese society and administration during the Meiji Era (明治時代, Meiji Jidai) (1868 – 1912), when the island nation was rapidly developing into a modernized industrial nation. 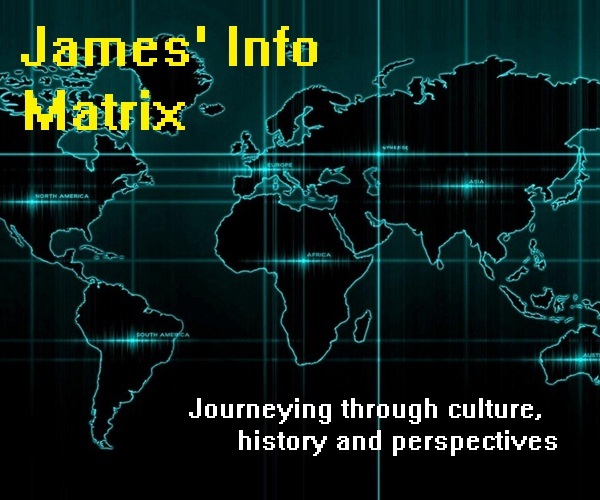 From his younger days, he learned and successfully mastered the foreign languages of Dutch and English (foreign relative to Japan), besides gaining an extensive knowledge of Western culture. He was thus able to serve the Japanese shogunate and government as a translator and ambassador to Western nations, conducting important international negotiations. Since English was a largely unknown language to Japan prior to the Meiji Era, Fukuzawa wrote one of the first few English-Japanese dictionaries to ease learning of the language for native Japanese. He subsequently became an educator in Western studies, Dutch and English. He also wrote many books and sources pertaining to political theories, which eventually contributed greatly to the reformation of the Japanese administrative system during the Meiji Era, thus modernizing Japan and preventing it from being a victim of Western imperialism. The reverse side, on the other hand, has an image of the statue of a Chinese phoenix (鳳凰, Houou) found in the temple of Byodo-in (平等院, Byoudou-in). 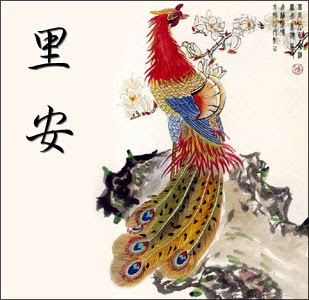 The Chinese phoenix, known also as Hōō in Japanese, has long been revered as a mythical bird that reigns over all other birds in East Asian tradition and folklore. From ancient times, the phoenix has often been symbolic of grace and high virtue in East Asian societies, being frequently utilised as ornamental motives for traditional weddings and royalties. It is also associated with justice, harmony, mercy, propriety and marital bliss, and is commonly said to be a righteous bird that appears only during good times but disappears during times of trouble. This particular statue of the Chinese phoenix depicted on the banknote can be found in the Buddhist temple of Byodo-in, situated in the city of Uji (宇治), Kyoto Prefecture. The main building of this temple is known as the Phoenix Hall (鳳凰堂, Houou-dou), which was constructed in 1053. It is atop this building where the actual statue of the phoenix stands majestically, adorning its roof. 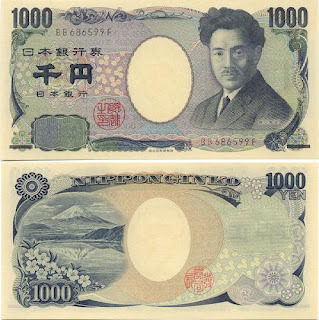 In a nutshell, Japanese banknotes used in this contemporary era have brought out some of the most unique elements of Japanese history and culture. Indeed, if you actually get hold of some of these banknotes, do try to take some time to scrutinize the pictures and portraits portrayed on them.